Constructed using nearly 5 ounces of platinum, Brenda Warburton executed this design using over 400 melee diamonds, totaling 8.96 cts. and showcasing the 14 cts. 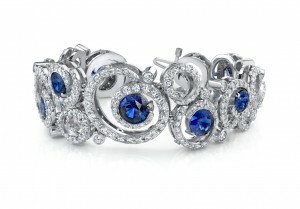 of exceptional blue sapphires. Click here to see more details. a 0.91 ct. yellow Sapphire and Diamonds (2.94 ctw). and rubellite tourmaline (1.38ct), and eight square yellow sapphires equaling 0.76cts. eleven spessartite garnets totaling 0.92ct. Rainbow pendant manufactured out of platinum and 18k yellow gold with a 1.92 ct. fancy triangle tanzanite and a 1.66 ct. fancy triangle amethyst set at either end of the pendant. The pendant is mostly constructed of a hollow twisted platinum tube pavé set with 1.5 mm round amethyst, ruby, pink sapphire, citrine, emerald, peridot, and sapphire. It is incredibly difficult on a technical level to bend hollow platinum tubing into smooth shapes. On top of that, once the tube was bent setting the very small soft gemstones presented an additional challenge. This pendant is beautiful to the eye and an amazing technical feat! Brenda J. Warburton is a finalist in the Colored Gemstone Design Award 2000 Contest in two categories, Manufacturers/Retail Manufacturers and Designers. The Colored Gemstones Design Award 2000 is a nationally sponsored jewelry design contest that had over 500 entries nationwide. Mrs. Warburton’s jewelry was selected to be in the 30 finalist entries in each category. Keeping with the theme of the contest, “Color Therapy”, Mrs. Warburton has created an earring and necklace suite, and a pair of earrings that each use numerous colored gemstones and diamonds. 14k yellow and white gold set with rhodolite garnets, peridot, citrine, amethyst, and diamonds. These earrings have moving partsthat rotate to provide mobile-like interest in the kinetic piece. The earrings and necklace that were finalists in the Manufacturers/Retail Manufacturers Division are 14k yellow and white gold set with amethyst, rhodolite garnet, citrine, peridot, blue topaz, and diamond. The earrings were also shown with a custom display stand in 18k yellow gold and platinum. The stand is $720.00. The best in show piece from the Michigan Jewelers Association is the only piece representing all of Michigan in The Jewelers of America National Competition in 2000. This piece was manufactured by Brenda Warburton at Austin & Warburton. It is 14k yellow and white gold brooch with citrine and amethyst. This piece is 14k rose gold, 0.99 ct, E VS1 center and 8 at 0.96 ct. in the sides (also E VS1). Designed and manufactured by Brenda Warburton.